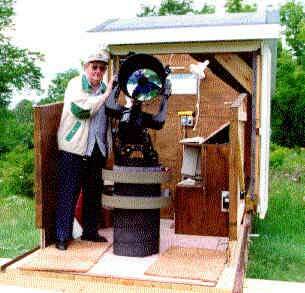 Doc G, shown above with the observatory is Emeritus Professor of Electrical and Computer Engineering at the University of Wisconsin - Madison. Sadly, he passed away on January 28, 2015. 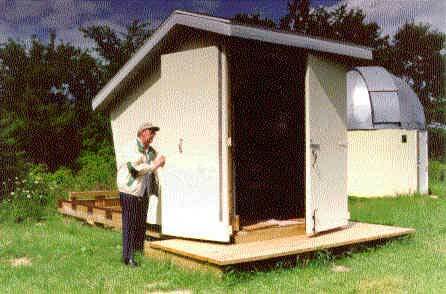 This roll-off building with a 12" LX200 telescope and accessories was donated to the Madison Astronomical Society by Doc G in June of 1996. When rolled back, a windbreak remains which is supplied with various shelves for computers and accessories as well as a comfortable place to sit to operate the telescope locally from the computer. The telescope is also remotely controllable, by computer, from the nearby clubhouse. In addition to the Meade 12" LX200 telescope in the DocG observatory, there is a second domed building shown in its most recent incarnation below. The recently rebuilt ten foot building sports a new Pro Dome installed in June 2001. The photo shows the installation of the dome almost completed. The Pro Dome with full automation using Digital Dome Works and a second Meade 12" LX200 telescope will be operational in September 2001. The Pro Dome, the LX200 telecope and numerous accessories including an SBIG ST-4 imager/guider were donated to the MAS by Dr. Greiner. It is owned and operated by the Madison Astronomical Society. 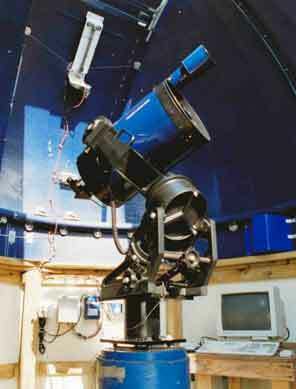 The MAS now has two computer controlled telescopes which can be operated from the nearby club house. Additionally there is a 17" Dobsonian in a roll-off building and a 16" CAT. The 16" CAT is a long focal length, 7900 mm, f19 designed mainly for planetary observation. The club house is a large all season building used for meetings and additional equipment. It is heated and air conditioned. The dark site is the Yanna Research Station located near Brooklyn, Wisconsin about 30 miles South of Madison, Wisconsin. 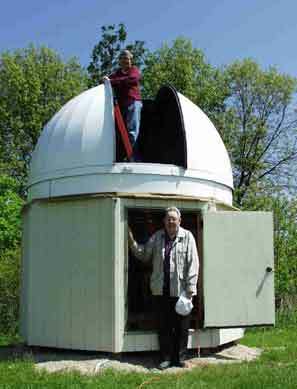 It is owned and operated by the Madison Astronomical Society.